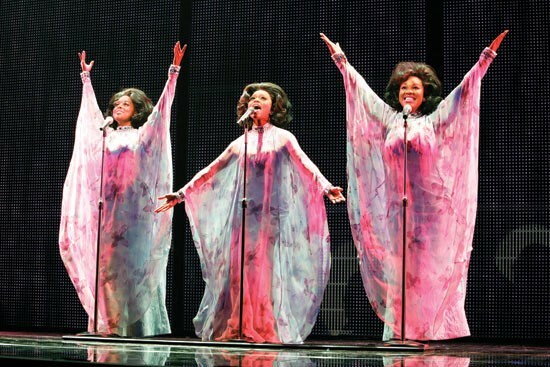 Dreamgirls, the hit musical inspired by Motown's powerhouse girl-group Diana Ross & the Supremes, is — as the oldie-station deejays are so fond of saying — a solid-gold classic. Jennifer Holliday's bone-rattling 1981 performance of the Act I finale "And I Am Telling You" brought Broadway audiences to their feet night after night. Jennifer Hudson brought home an Oscar when she sang Holliday's signature role in the 2006 film adaptation of Dreamgirls. Local productions of the show have found Soulsville audiences dancing in the aisles to a Detroit groove. Dreamgirls mixes a little of Jersey Boys with a lot of American Idol. It's all cutthroat business deals, catfights, and backstage melodrama. Then the spotlights shine down, the sparkling gowns come out, and every diva in the house is given her moment to shine. The story is a familiar one. Three girls with big voices and bigger dreams catch a break singing backup for the James Brown-inspired singer James Early. As their fame grows, friendships fail and fall apart. And the beat goes on. Director Robert Longbottom has dialed up the glitz for his ambitious revival of a show that's already something of an extravaganza. Concert lighting and an environment composed of ever-shifting panels keeps the action moving at an accelerated pace. William Ivey Long's costumes have been designed to make quick changes into dazzling set pieces. "Dreamgirls" at The Orpheum from November 30th-December 5th. Tickets are $25-$95.